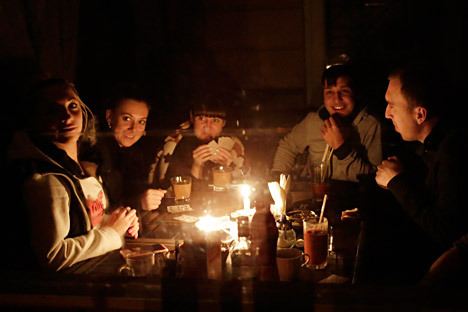 People play cards in Simferopol on Nov. 22, 2015. Crimea declared a state of emergency on Nov. 22, 2015 after its main electricity lines from Ukraine were blown up, leaving the peninsula in darkness after the second such attack in as many days. The murder of Boris Nemtsov was arguably the most discussed domestic political issue in Russia this year, along with the bankruptcy of Transaero, the blackout in Crimea and protests by long-haul truckers. Opposition leader and former Russian first deputy Prime Minister Boris Nemtsov was killed in central Moscow on Feb. 27. He was 55. According to Russia’s Investigative Committee, Nemtsov was walking along the Bolshoi Moskvoretsky Bridge near the Kremlin a little after 11 p.m. when a white car pulled alongside him and fired a number of shots at point-blank range, hitting him in the back. Five men from Chechnya were arrested in connection with the murder, and arguments were made that the incident had religious motives, as Nemtsov had made some disparaging comments about Islam in the wake of the January attacks on the editorial offices of Charlie Hebdo in Paris. Nemtsov’s allies instead linked the murder to a report he was working on documenting evidence of Russia’s alleged involvement in the civil war in eastern Ukraine, including financing of the rebel movement and provision of weapons and soldiers under the guise of “volunteers.” The report, entitled “Putin.War,” was later published by Nemtsov supporters led by Ilya Yashin. The five suspects remain in custody in Moscow and the investigation is ongoing. In September, a representative of Nemtsov’s family asked that the case be investigated as “an attempt on the life of a statesman,” a separate article in the Russian criminal code from murder. A native of Sochi, Nemtsov rose to prominence in the 1990s, first as governor of Russia’s third largest city, Nizhny Novgorod and later as first deputy prime minister in the administration of Boris Yeltsin. He was one of the most prominent members of Russia’s liberal opposition. In 1999, Nemtsov founded the political party the Union of Right Forces (SPS). After the SPS party split, Nemtsov worked with other opposition movements and parties. He was active in the protests against electoral fraud in the winter of 2011-2012 and was a member of the coordinating committee of the current Russian opposition movement. Since 2012 Nemtsov had been a co-chair of the Republican Party of Russia — People’s Freedom Party. In September, the press reported that Russia’s second-largest airline, Transaero, was so debt-laden that it couldn’t afford to refuel its planes. Initially the government’s transportation management agencies decided to allow the country’s flagship carrier, Aeroflot, to acquire a 75 percent stake in Transaero to save the company, but Transaero shareholders were unable to consolidate a large enough block of shares and the deal fell through. Later, a major shareholder in Russia’s third-largest carrier, S7 Airlines, agreed to buy 51 percent of Transaero, but then backed out of the deal. At the moment, the company seems headed for bankruptcy, as it has nothing left to offer potential buyers. Transaero has been banned from flying or selling tickets and its major international routes have been taken over by Aeroflot. Anna Bazoyeva, an analyst at investment company UFS, believes that bankruptcy, while the likely path forward, sets a bad precedent. “This example will once again remind businesses that aggressive growth based on borrowed money is a road leading to nowhere,” she said, adding that while financial institutions like banks and leasing companies will be affected the most by the bankruptcy, it will also hurt Transaero shareholders, who are mainly private individuals. Passengers will also suffer, according to Dmitry Baranov, an expert at Finam Management. “The company’s bankruptcy will not benefit anyone, including its creditors, and many populated areas will not have good transportation accessibility,” he said. Until recently, Transaero operated flights to 260 destinations and accounted for 14 percent of the domestic aviation market. From January to July this year, 7.5 million passengers flew with Transaero. The company’s finances had weakened due to the recession and sharp devaluation of the ruble, which have depressed demand for travel and raised the cost of airplane leasing agreements, which are often denominated in dollars. Transaero’s 260 million ruble debt includes 150 billion rubles ($2.4 billion) owed in leasing obligations and 20 billion rubles ($325 million) owed to airport management and fuel companies. The solemn inauguration of the so-called “energy bridge” along the bottom of the Kerch Strait between the Krasnodar Territory and Crimea on Dec. 2 was a joyous occasion for local residents, who had been living without power for more than a week after Ukrainian nationalists sabotaged pylons carrying power lines to the peninsula from Ukraine’s Kherson Region. However, for many the “energy bridge” still has only symbolic significance. The power line provides only 200MW of the 500MW Crimea needs from outside sources. After two additional circuits come online next May, Russia will supply all the power needed by the peninsula. Surprisingly, considering the tensions between Ukraine and Russia, the incident took the Crimean authorities by surprise. According to Russian Deputy Energy Minister Andrei Cherezov, out of the 94 supermarkets on the peninsula, only 10 have autonomous power supply sources. Local authorities were forced to supply power only to critical facilities such as hospitals while other consumers were switched to rolling blackouts. The government had to immediately transfer a large number of diesel generators onto the peninsula and speed up work on the “energy bridge,” which consists of an electricity cable from Russia’s southern Kuban region to Crimea. Many local residents and officials questioned why the cable had not been laid earlier, as Crimea has ruled by Russia for a year and a half already. According to Russian Energy Minister Alexander Novak, the problem was that the difficulties of laying the cable along the bottom of the Kerch Strait, but that Russia does not produce cables of the length needed, and most of Russia’s foreign partners refused to supply the cable as a result of sanctions. In the end the cable was bought from China, but the ship carrying it from Shanghai arrived only on Oct. 11. The incident raised questions about Russia’s ability to support the region, particularly securing its water supply. On April 26, 2014, Ukraine blocked the locks of the North Crimean Canal, which channeled water from the Dnieper River to Crimea. Since that time Moscow has provided only temporary solutions. As of Nov. 15, new tolls have been introduced on major intercity highways in Russia. The toll collection system, called Platon, applies to trucks weighing over 12 tons using federal highways and charges 3.73 rubles ($0.06) per kilometer. Even before Platon came into effect, long-haul drivers began protesting against the new levy, arguing it would cut into already slim profit margins. Trucks moved along federal highways at minimal speed, causing massive traffic jams. The authorities responded to the protest by lowering the toll for the first three-and-a-half months to 1.53 rubles ($0.02) per kilometer, and by considerably reducing the penalty for non-payment. Initially, the penalty for companies was 450,000 rubles ($6,500) for the first non-payment and 1 million rubles ($14,000) for repeat non-payment. The penalty was reduced for individuals and companies alike to 5,000 rubles ($70) for the first offense, and 10,000 rubles ($140) for repeat non-payment. Despite the concessions made by the authorities, the truckers have continued their protest. Activists from the regions have more than once announced their intention to come to Moscow and stage the main protest there by blocking traffic along the Moscow ring road. On Dec. 4, several groups of protesters appeared on roads leading to Moscow, although the protest ended peacefully on Dec 7. The authorities have indicated that they will not cancel or suspend the Platon system. In an interview with the business daily RBK, the head of federal road agency Rosavtodor, Roman Starovoit, insisted that an absolute majority of long-haul drivers did not object to the new levy and that the protest involved no more than 1 percent of all truckers in Russia. According to Starovoit, more than two thirds of all 12-ton trucks have already registered with the system. It would be an overstatement to say that the truckers’ protest has received considerable support beyond the relevant professional community, although the participants in the actions say that ordinary people have been supporting them, offering to put them up for the night and bringing hot food and drinks.